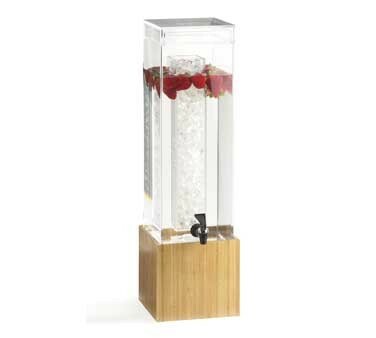 Provide your customers with easy access to your refreshments with the Cal-Mil 1527-3-60 Bamboo Acrylic Beverage Dispenser with Ice Chamber 3 Gallon. Designed to provide maximum visibility while minimizing the risk of breakage, this premium quality beverage server is made from exceptionally durable acrylic. Capturing the look of delicate glass, this dispenser showcases colorful refreshments while its eco-friendly bamboo base elevates it to cup height for easy filling. To keep your drinks cold for hours, this BPA-free dispenser is designed with an ice chamber in the center. For ease of use, this beverage dispenser has a removable spigot for quick cleaning and a drip tray for mess-free service..